It has been a sad 7 days for most of us in Singapore as we mourn the death of our great leader Mr Lee Kuan Yew. I cried many times while reading and watching tributes to him on the web and tv. Love him or hate him, we cannot deny that Mr Lee had brought our country to where we are now. Of course he also have a group of very capable people to helped him with this; seriously which leaders do not have a good support team, but without his great leadership and determination things would probably turned out less favourable to us. Sure, some of the things he did was not right; politically or humanely but I admire his courage to admit these mistakes and take responsibility for it. And with the tributes being aired, we should also know that there are still some "sensitive" political issues that was not shown. Throughout the week, tongues were held for as long as possible, even if there were disgruntled comments or views it was kept private and only discussed among friends. Then things starting to change, with the major part of the initial pain of loss slowly subsiding, people started to think of ways to honour Mr Lee. Such things caused unhappiness and unrest among us, caused us to take sides (even if you choose not to join you are seen as taking side, the ignorant or boh chap side). Feeling irritated; partly coz I was unable to write any blog post as we joined the rest in the 7 days National Mourning period, I wrote this on my Notes in facebook. On Tuesday 24th March 2015, I managed to write my condolences card at Istana. It was not because Istana was along the way to my office, it was not because there were no snaking queue and only less than 10 people writing on the long white table, it was because I just have to do it. I took a glance at the condolence cards displayed, the flowers and cards/poem others left there, I didn't dare to linger because I know my tears will flow uncontrollably. Later that week I decided to join the many Singaporeans who queued up at the Padang to pay their last respect to Mr Lee. I didn't want to bring DinoBoy along because he has school performance rehearsal and I don't want him to go through the long hours of waiting as he had school performance the next day. I must thanks Mabel for accompanying me, we initially wanted to go on Friday night coz there will be no scorching Sun but when we read online that it is an easy 8 - 10hours of queue in the line before we can set foot into the Parliament House. We made a last minute change of plan; thanks to my wonderful bosses who approved my last minute extra half day leave application via SMS, and we were at City Hall at around 9am, took a long winding walk towards Padang and was in the queue around 9.20am. What makes me feel the need to pay my last respect to this great man? Well, first of all I have the opportunity to see and experienced the changes he made to our lives. It may not be as great impact as it was for the earlier generations but they were significant changes, one of the World Top Airport & World Cleanest City, World Busiest Port, World Greenery City etc. Secondly, I remembered during earlier days' General Elections, I will be sitting in front of the tv with my father, listening to the speeches and rallies going on. I've also stayed up late till wee hours to wait for the announcement of the wining party. Young as I may have been at that time and probably did not understand half the thing he said back then but I was captivated by Mr Lee's speeches. They were delivered in such a strong and forceful tone, assuring me that I CAN believe in him to make Singapore a better place. His eyes bored into me from the tv screen, that makes me WANT TO believe him that he WILL make Singapore a better country. He speaks genuinely from his heart and he delivered what he had promised. Try to find some videos on his speeches and listen to it yourself and you probably will understand what I meant. So after 4 hours of sitting, standing, strolling in the queue, I made it to Parliament House. It was exceptionally quiet after we cleared the security check point. I guess every one was caught up with the emotions which they have left behind hours before and it came back to them when they realized that in minutes we will be in the presence of the late Mr Lee Kuan Yew. Our gratitude, sadness, sense of lost all came tumbling back to us and we have to gather our thoughts to handle these emotions. The area was silent except for the soothing voice of this lady singing a sad "Home" (sorry I do not know who is she because I was not paying attention to her). Shuffling of feet, soft sobbing & sniffling, occasion words from the guards to ask us to move along the line quickly. Within minutes we were out of the Parliament House, I was glad that I was able to give a full bow in front of him and said a quick silent prayer for him too. 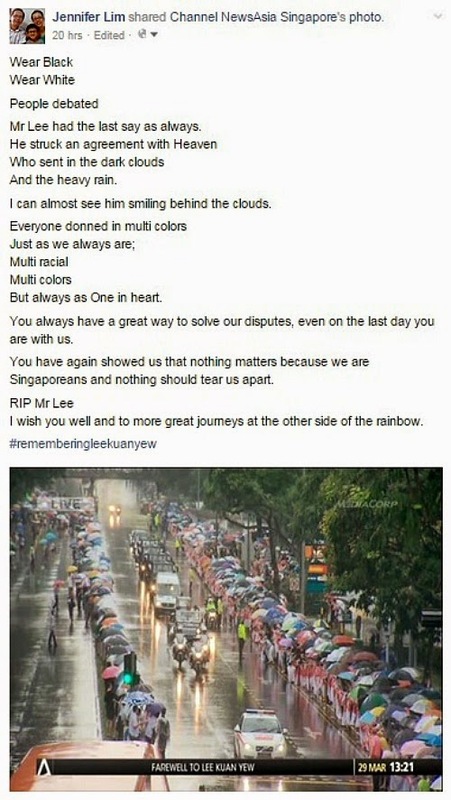 On Sunday 29 March 2015, he left the Parliament House for the last time and his cortège made it's 15.4km route, passing pass significant landmarks, such as Old Parliament House, City Hall, the Padang, NTUC Centre and Singapore Conference Hall; as well as heartland areas, to the University Cultural Centre (UCC), National University of Singapore for the State Funeral. The day was solemn and dark clouds loomed over our heads. When the ceremony started and the Coffin Bearers moved Mr Lee's coffin from Parliament House to the Ceremonial Gun Carriage, it rained and it poured. Black or White? I did not see any, I only see Red, White, Crescent and Five Stars. Farewell Mr Lee, Sir, you have taught us well and yes, you have always showed us that we should put aside our different views and opinions to fight for a common goal. We thank you for that! "Sometimes change is very, very painful. But in order to come out of the cocoon and spread your wings into a beautiful butterfly you must go through the pain." Let's all dry our tears and brace ourselves to face the new challenges that we will have down the roads. I know we, Singaporeans can do it! 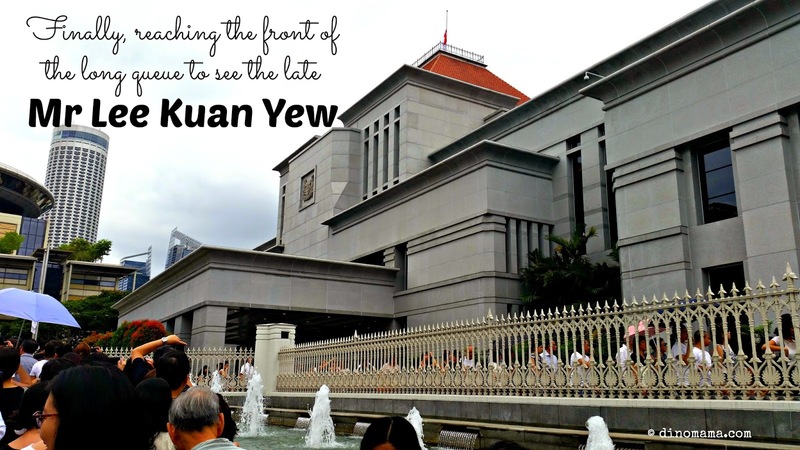 PS : To learn more about our founding father of modern Singapore Mr Lee Kuan Yew's legacy, you can visit Remembering Lee Kuan Yew or google about him.